Recommended for home use, the Solo® allows individuals and families the opportunity to experience the IonCleanse® process in the comforts of their own home. In addition to your IonCleanse® ion machine, this package includes everything you see pictured to the left: 1 complete array, the IonCleanse® foot tub, 1 box of liners (30 total), a water bottle, salt, quick start guide, instructional DVD, a custom-made protective carrying case, as well as a full 3-year warranty and a 60-day, 100% money-back guarantee. You also receive free access to our Detoxr for Kids iOS app. 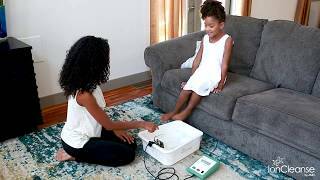 Along with the IonCleanse® Premier® foot detoxification machine, the IonCleanse® Solo® detox foot bath is the ONLY unit of its type to receive true FCC & CE safety approvals, making them the safest detox baths available on the market. Anyone can say anything on the internet. A computer-generated certificate is not enough to ensure the machine you are researching is safe. To be sure, ask for the substantiating safety reports before you buy (ours are listed below). The reports should be more than 40 pages in length. While you may not need to read the reports in their entirety, they are very easy to browse through for authenticity. The IonCleanse® Solo® machine is constructed using the same quality of components as the IonCleanse® Premier® unit. Because of the volume of sales of the Solo® unit, we are able to take advantage of volume discounts on parts and components and pass the savings along to the consumer. Additionally, the Solo® system outputs the same current into the water as the Premier® machine. A 30-minute session with the Premier® on mode three will yield the same results as the Solo® for 30 minutes. The single program on the IonCleanse® Solo® system is a 70/30 mix of negative ions to positive ions. This program accommodates most users and is ideal for the layperson. As with the Premier®, the Solo® system has the ability to create positive as well as negative ions in the water. Due largely in part to the patented array configuration, the dual polarity feature provides a much more comprehensive purification session than other ionic foot baths on the market. The use of ionization devices is far more complicated than simply putting someone's feet in the water and turning on the switch. The reason for AMD's popularity and success is the support it provides to both practitioners and individuals on a continuing basis. For as long as you own the product, we will help you use the IonCleanse systems safely and effectively. Another IonCleanse® system exclusive is the runtime counter. This counter, similar to an odometer in an automobile, keeps track of the total number of minutes the IonCleanse® has run. This great feature can be used to help keep track of the number of sessions a set of plates has been used. No other detoxifying foot bath on the market offers this capability. The IonCleanse® machines are manufactured and assembled in the United States (see our Made in the USA page for more details). Strict quality control standards along with a team of engineers with over 100 years of combined experience ensure that the IonCleanse® products are the top-of-the-line system available for the consumer. A Major Difference, Inc. (“AMD”) accepts returns of the IonCleanse® Solo® system purchase up to 60 days after the date of receipt of the package for a full refund less any shipping fees. At AMD’s discretion, any damaged or missing components may be deducted from the return amount due. This offer is limited to customers who have not previously returned their system for a refund..See our A+ rating with the BBB. The IonCleanse® Solo® system received official recognition from the FDA as well as Health Canada (the Canadian equivalent to the FDA) as a non-medical device. Click here to see the 513(g) letter from the FDA, and click here to see the Health Canada letter. Approximate product dimensions: Control unit - 8" x 6" x 3"
Carrying case - 18" x 13.5" x 5.5"
Foot tub - 17.5-12.5" (tapered) x 15" x 6"
Array - 5.5" x 3" x 2"
Product weights: Control unit - 1.5 lbs. Carrying case - 3.5 lbs. Foot tub - 3.0 lbs. Total shipping weight: 17 lbs. Ships via UPS with a signature required. 31 lbs. dimensional weight Because of the size of the box used for packaging, dimensional weight is used to calculate shipping fees for "air" packages. Power input: 100-240V ~47-63Hz 1.35A The medical grade power supply we use can accept 100-240V which means it can be (and has been) used all over the world. Power output: 16-21V - 50W max (Set Up 20V - 2.5A) The IonCleanse® system is classified as low voltage equipment. Overnight repair service: Available for purchase Applies to U.S. residents only. Money-back guarantee: 60-day, 100% See our return policy. AMD's in-house financing option. Click here to learn more. No payments and no interest if paid in full within 6 months. Click here to learn more.